From Goodreads ~ When I agreed to stand by my best friend, Basia, on her big day, I had no idea what I was in for. Bouquets and unflattering evening wear I can handle. But between disgruntled dates, a beach venue and suspicious packages, what else can go wrong? Oh, right - my parents don’t know I’ve moved in with Slash. Oops? Meanwhile, Elvis and Xavier’s boss at ComQuest has asked X-Corp - well, me - to take a quick trip to retrieve a sensitive company package from the British Virgin Islands. No hacking involved. Just show up, accept the package and bring it home safely. A cushy assignment and a safe one. Right? Wrong. Things start to unravel the minute I set foot on the boat to the island. Before I know it, I’m up to my neck in thugs, sand and trouble. I’m going to have to work fast to stop the bad guys before the sun sets for good on this unexpected beach vacation. Lexi is a master hacker and director for X-Corp, an intelligence and security company. Her best friends, Basia and Xavier, are getting married and Lexi is the maid of honour. She loves that her friends are getting married but she's not looking forward to having such a big part in the ceremony and reception. But her boyfriend, Slash, who is a government agent and fellow hacker, will be there for support. What could go wrong at the wedding? Well, lots! After the wedding, Lexi accepts an assignment from Xavier's boss to go to the British Virgin Islands to pick up a package that was misdirected there. An easy enough assignment, right? Wrong! Nothing with Lexi is easy and she has an Excel spreadsheet to prove it. 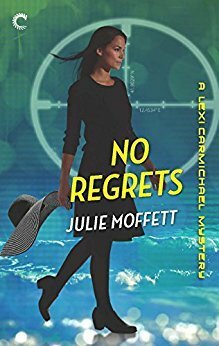 Though this is the tenth (and latest) in the Lexi Carmichael series, it works as a stand alone as you are provided with background. I've like the series and have read them all. It is written in first person perspective from Lexi's point of view. I liked the writing style and there was humour. There wasn't a lot of hacking but as usual, there was lots of adventure in the second part of the book. It's been interesting to watch Lexi grow from being a geek with just one friend, no life and no social skills to not only having close friends, a boyfriend with whom she is now living with but also confidence.